These are one of our most popular event rentals. While only two people can interact with a dunk tank at a time (the thrower and person being dunked), it can entertain endless numbers of people watching their best friend, teacher or coach getting dunked. 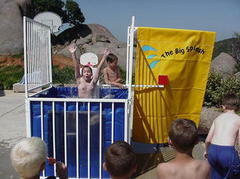 With nearly 400 gallons of water inside, the dunkee will fall harmlessly into the water before coming back up for more. Note: Customer is responsible for filling up the dunk tank. Average fill time with a garden hose is one hour.